After my inspiration post last week, I was on a mission to finally do something with all of the adorable kids artwork I had collected over the years. 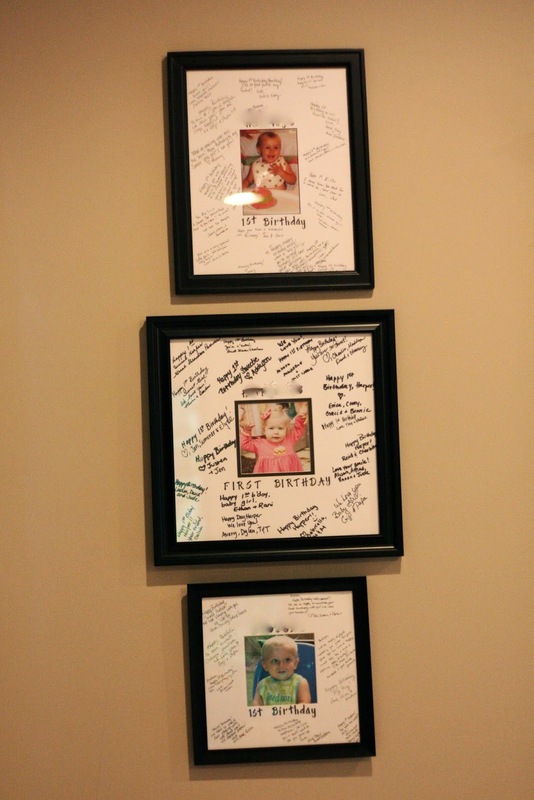 I decided to go with a gallery wall in our playroom. I didn't want to spend a lot of money so I actually ended up finding every single frame I used for this wall at Wal-Mart. They had a ton of frames to choose from so I literally just grabbed a few of each one and the price was right. All of the frames were between $2-$12 each. One thing to keep in mind is that a lot of the artwork is odd sizes and they don't always make stock frames in the correct sizes. I didn't want to have the art custom framed (because that would have cost an arm and a leg) and I was totally fine with trimming the art down a bit to fit into the frames I could find. For things that were an odd shape, I either used burlap or the solid backing that came with the frame as a mat. After getting it all framed I spaced it out on the floor to see about how I wanted it to look, I called in my handyman husband to help me hang it all. 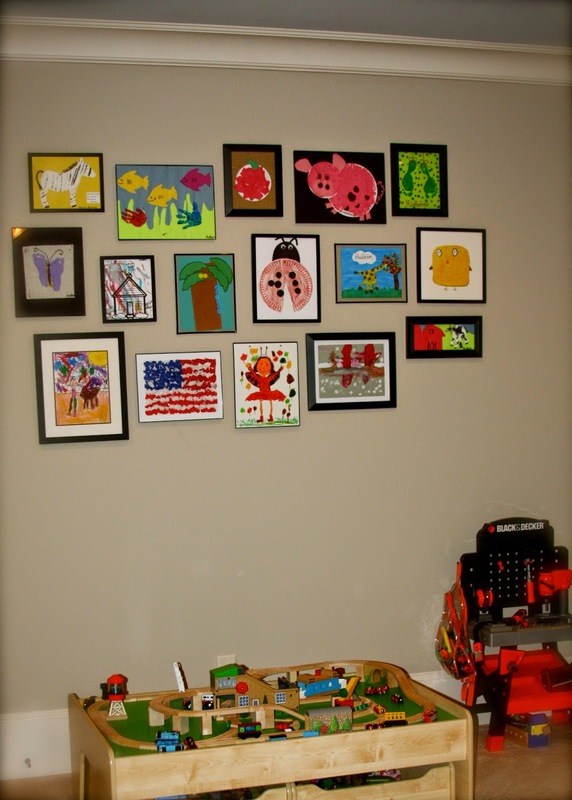 I picked the largest wall in our playroom and I thought I had a lot of art work framed. However, because this wall is really big and our ceilings are really high, there is still a lot more blank space than I had planned on. Oops. There was no way I would have even asked my hubby to start over and put more holes in the wall by spacing the frames out a little more. So I've just decided I'm kind of happy about that blank space because it means I have a lot more room to work with and add to over the years. The kids' schools have art shows as fundraisers where you can purchase their framed artwork each year, so I know I will have those to add to the wall. And, I'm sure next week I'll have at least 5 more things that come home I can put up there, too. That's why I like the idea of using all different frames for gallery walls. It makes it easier to just keep picking up black frames along the way and then I don't have to worry if they match the others. I did the same thing on my photo gallery wall and have already picked up other random frames to add to this display when I get my beach photographs printed. 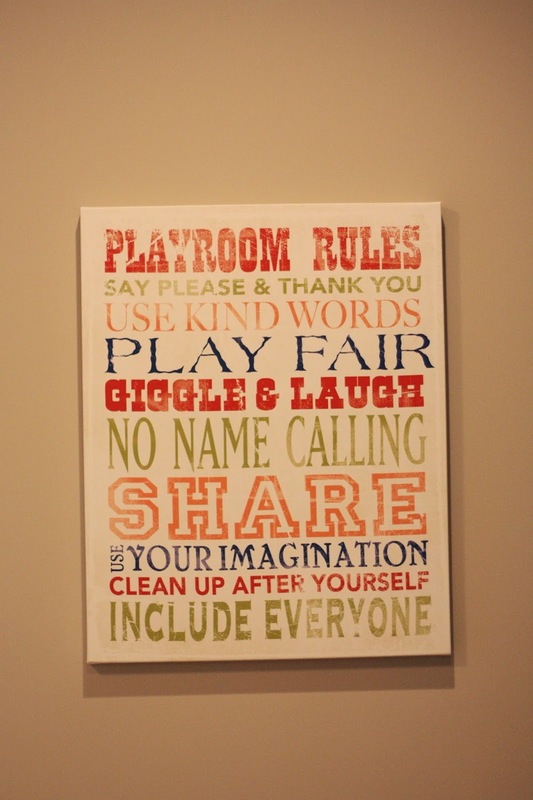 While we were hanging stuff yesterday I also finally got this adorable canvas up that was a HomeGoods find and their first birthday pictures with signed mats hung, too! I have one more wall to fill above our little kitchen with some fun red frames I bought ages ago, but until I have pictures to put in them, I decided to hold off on hanging those. There are several other things I want to do in this room (like curtains), but for now I'm happy with the way it is coming along and so thankful for a fun space for my kids to play. Lori - Great idea to use the colors from Frozen and be able to not have to totally redo the room when they want something different. AND, I'm sure they will love the craft table. Mine use the one we got for Christmas a few years ago daily!! !